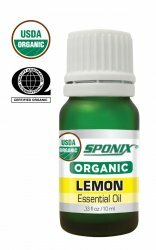 Native to India, Sponix Lemon Oil is produced through a process called steam distillation. It's familiar lemon-like scent is widely used in aromatherapy and many health-related uses. It has numerous naturally occurring properties such as antibacterial, antifungal, anti-inflammatory, astringent, antioxidant and many more. Lemon is commonly used as a natural bug repellant and a natural regimen for headache, fever, flu and cramp relief. It also known to act as a muscle relaxer and a natural aid for sleep and stress. On the beauty side, many are using this product as an ingredient for a natural facial mask and facial sauna. This also help repel bacteria that cause acne and other skin problems. Sponix only uses the finest ingredients in the market to produce high quality oils.